Weakening economies, cash starved customers and falling prices of rival smartphones are hurting sales of Apple iPhones across Europe, data from research firm Kantar Worldpanel ComTech showed on Thursday. The October roll-out of Apple's iPhone 4S boosted its position in Britain and United States, but the new phones failed to excite interest in continental Europe, where Apple's share of the fast-growing smartphone market slipped. 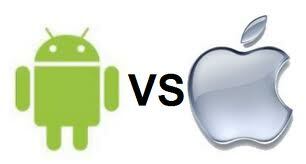 The smartphone industry is dominated by Google, which has stormed the market with its free Android platform.